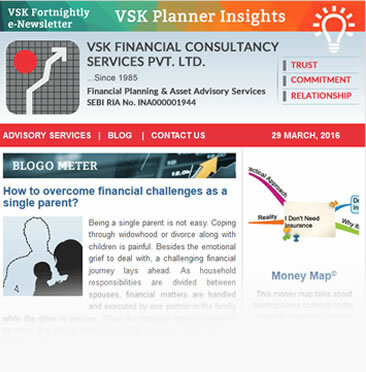 VSK Planner Insights is a monthly newsletter which is published every alternate Tuesday. Our constant endeavor has been to produce versatile content to educate and engage our readers. × Almost Finished...We need to confirm your email address. To complete the subscription process, please click the link in email we just sent you. Covers various financial topics ranging from investments, taxation, insurance, retirement, life planning, financial planning, banking, debt management, etc. The blog article content is created by VSK. Is like WIKI which provides basic information on a financial topic in brief. Covers diverse non-financial subjects ranging from health, time management, parenting, spiritual, meditation, etc which could be of particular interest to our readers. We bring you rich content by short listing articles from the best blogs. Covers our unique patented mind maps on financial topics. Covers videos created by VSK on financial subjects. Covers small snippets of financial information which is commonly not known to a lay person. Choose Date of the Newsletter.